Trucks owned by our European Agents Guido Klatte used for transporting your horses in Europe. Equine International Airfreight means full door to door service. We arrange, with specialised road freight companies who operate a fleet of modern trucks of the highest standards and quality, to transport your horse to and from our pre export quarantine stables and the airport of departure. We only deal with trustworthy road freight partners aim for customer satisfaction and the well being of the horse and who employee drivers who are horse people who understand the needs of their passengers. 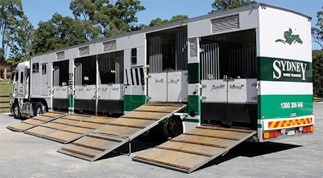 Should a client wish to arrange their own transportation for either delivery to our quarantine farms or pick up at the conclusion of the post arrival quarantine period, that is fine as long as Equine International Airfreight has been provided with all driver details and truck identification. It is not possible for individual owners to collect their horses from the airport on arrival into Australia if the horse needs to enter the government post arrival quarantine facility. Equine International Airfreight will arrange this transport sector. It is essential that all Road transport arrangements are coordinated through our office to ensure a seamless transfer from quarantine stable to airport and visa versa. Internationally, our experienced arrival agents will arrange road freight for arriving and departing horses through specialised partners who work with modern trucks of the highest standards and quality and use only the most experienced drivers. Details of which road freight companies are used in different locations, can be provided on request.